I just got back from a trip to Detroit to visit Ford Motor Company, where I had the opportunity to sit down with a dynamic group of individuals and learn all about the new 2009 Ford Flex, got a walk-around tour of the vehicle, and then learned about Ford’s Blueprint for Sustainability. I have lots of video coming, but I thought I’d tell you a little bit about it right away. During the first sit down interview (think “The View”), I was joined by several Ford Execs, including Anthony Prozzi, Ford Designer (Interior Design Manager of the Flex), Kate Pearce, Ford Flex Marketing Manager, and Usha Raghavachari, Ford CUV Marketing Communications Manager, who shared their insight, expert information and passion about the Flex. Jay Ward, Ford SUV/CUV Communications Manager, later joined us for the walk-around tour of the vehicle. 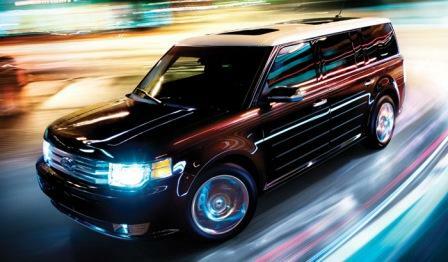 So what is the Ford Flex? Well Kate Pearce said that “it’s something really unique and different in the market.” It’s defined by Ford as a crossover, which is a vehicle that combines the best features of a car, coupled with the capabilities of an SUV. 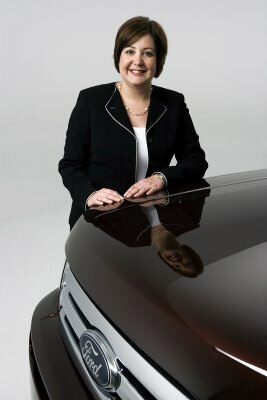 “We fundamentally believe that Flex is the next game changer for Ford. There will be nothing else like it in the marketplace,” said Kate Pearce. 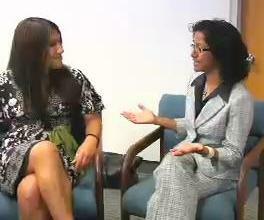 Usha Raghavachari, Ford CUV Marketing Communications Manager talks to the CarsDiva about the Ford Flex customer. CarsDiva wearing a Lilliston Ford t-shirt from their Flex event. For those of you “Flex Fanatics” out there, (or for those whose interest was peaked), check out my new social network devoted to the Flex, spun out of CarsDiva.com, called FlexFans.org, which centers on the Ford Flex. And take a peak at the calendar to learn about Flex events in your area, and to see which Flex event I’ll be at next! 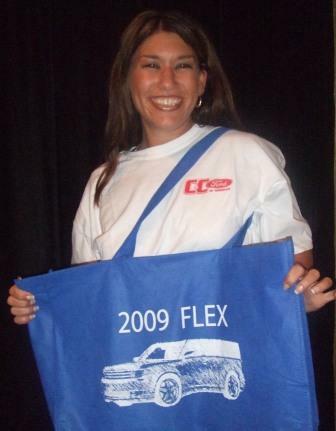 CarsDiva sporting a Flex t-shirt and toting a Flex bag from C & C Ford. Videos (and more on Ford’s Blueprint for Sustainability with John Viera, Director of Sustainable Business Strategies) soon to follow!! !